It’s fall, and I’m excited. It’s my favorite season to cook and bake, and find myself going through magazines, scrounging through books, and checking out websites non-stop to find good fall recipes. I’ve noticed that fall is the favorite season of a lot of my fellow food bloggers too, which makes me happy. For happy and inspired food bloggers = yummy posts! So, as a happy blogger myself I made squash last night for dinner. My Nanny gave it to me and right away I knew what to do with it – caramelize it! Begin by peeling the squash and chop into large pieces. This peeling process takes a while, but it’s totally worth it. Then combine squash, butter, sugar, cinnamon, salt and pepper in a bowl and toss together. 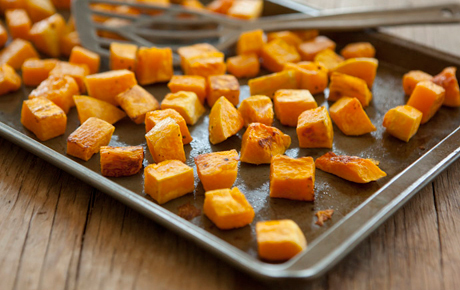 Pour squash out onto a rimmed baking sheet and bake for about an hour or until browned. 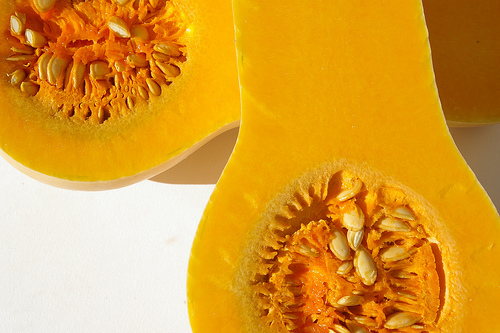 This recipe is original and serves 8 hungry squash lovers as a side dish. 2. Peel squash and chop into large pieces. 3. 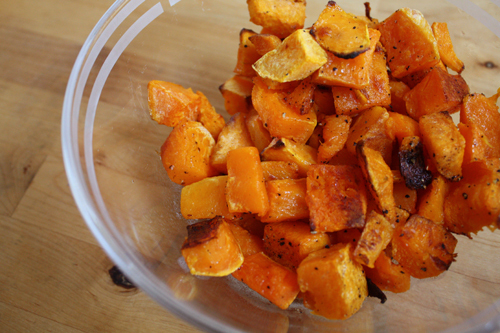 Combine squash, butter, sugar, cinnamon, salt and pepper in a bowl. Toss. 4. Pour squash out onto a rimmed baking sheet. 5. Bake for about an hour or until browned. I have so much butternut squash I hardly know what to do with it all. I’m definitely going to try caramelizing it…sounds delicious! Mmm winter squash is one of the things I get most excited about for fall. This looks so delicious. Oh yum! This sounds delicious! 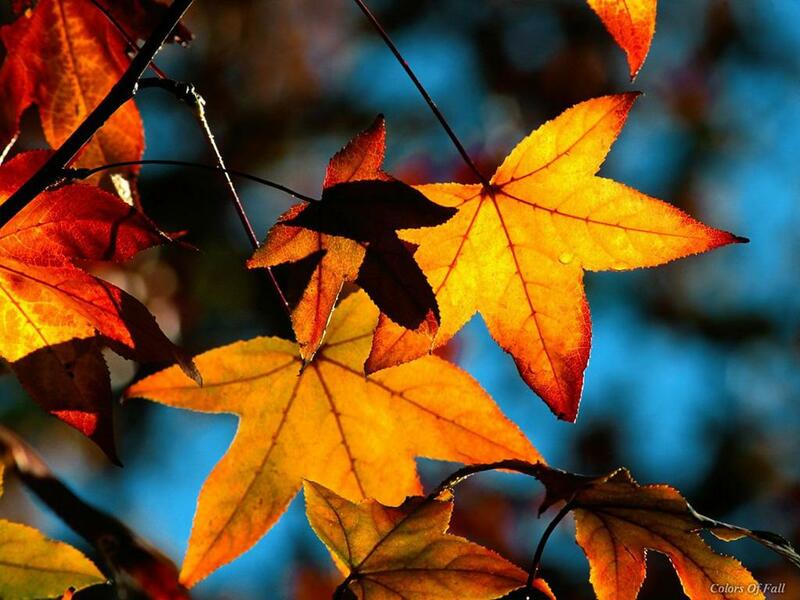 And I am super excited for Fall too! Oh, I love this side dish idea! I’m definitely going to have to pick up some butternut squash soon so I can make this. Thanks for sharing this, Katrina! It looks delish. How did I miss this recipe from a few weeks ago. It sounds super delish. And nothing beats a good soup when the weather starts to get a little chilly. This sounds like a wonderfully healthy side dish. I’d take this over mashed potatoes any day. Yum that looks delish! I just did the same thing with yams, but I will have to try it with the squash I have sitting in my pantry awaiting something “fall”.